We can now price more stores faster and more strategically with the same number of fuel pricing analysts. 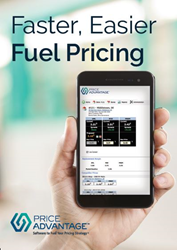 PriceAdvantage, a fuel price management software company and division of Skyline Products, announced today that Maverik Inc. has chosen PriceAdvantage software to streamline their fuel price management at 274 of their convenience stores located throughout 10 western states. Maverik selected PriceAdvantage based on the software’s ability to allow Maverik fuel pricing analysts to conduct price research in each market to help increase volumes, retain margins, and improve overall profits. “Maverik recognized that they could not continue to depend upon manual fuel pricing processes to keep up with their planned growth, the competition, and market fluctuations,” shared Chip Stadjuhar, President and CEO of Skyline Products. “Delayed price changes, even for just a few hours, can have significant impact on their bottom line. PriceAdvantage will incorporate Maverik’s pricing strategy so that they can quickly, and predictably, respond to market changes. PriceAdvantage easily integrated with Maverik’s instances of PDI Enterprise and Radiant Systems, allowing the team to be up-and-running quickly. Additionally, the PriceAdvantage interface is incredibly intuitive and easy-to-use which expedited user adoption.